JobEngine: a beautiful, mobile-friendly job board theme for WordPress. JobEngine is easy to set up and highly customizable. It is available in multiple languages. You get plenty of awesome premium extensions to choose from. Joby: a JobRoller child theme with 8 color schemes, 4 homepage variations, 4 header layouts, and beautiful job listings and single pages. It has wide/boxed layouts and jobs map, tweets, and other custom widgets. Workscout: a WP Job Manager powered job board theme for WordPress. It comes integrated with Google Maps. Job hunters can apply to jobs on your site or bookmark them for the future. 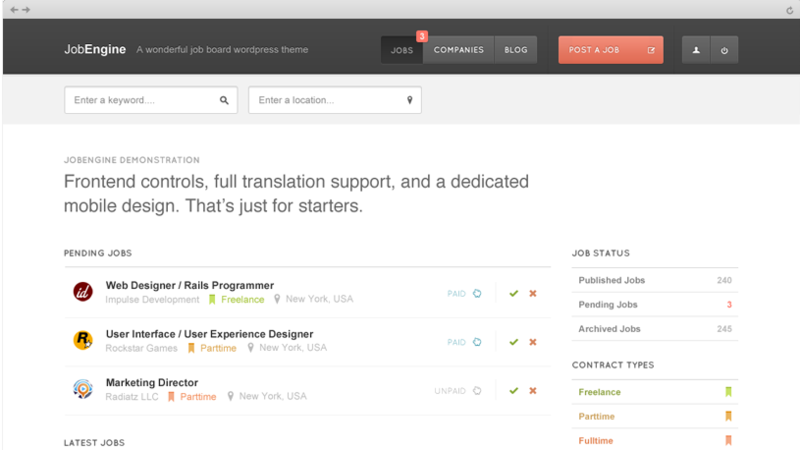 Workscout allows webmasters to charge for uploading jobs and resumes. Subscription plans are supported. 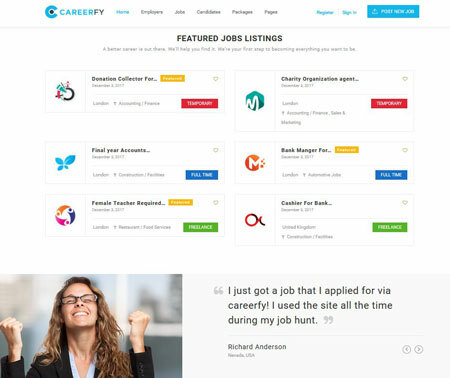 Careerfy: a responsive job portal theme with customizable templates ready to go. It supports RTL languages. Users can apply with Facebook & LinkedIn, import Indeed jobs, build a resume, and do a whole lot more. The theme comes integrated with WooCommerce. 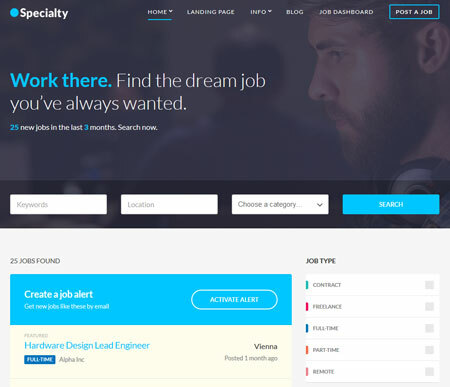 Specialty: this job theme comes with drag & drop landing pages, responsive layout, and flexible search. It is powered by WP Job Manager. Works with Divi, Elementor, and other top page builders. 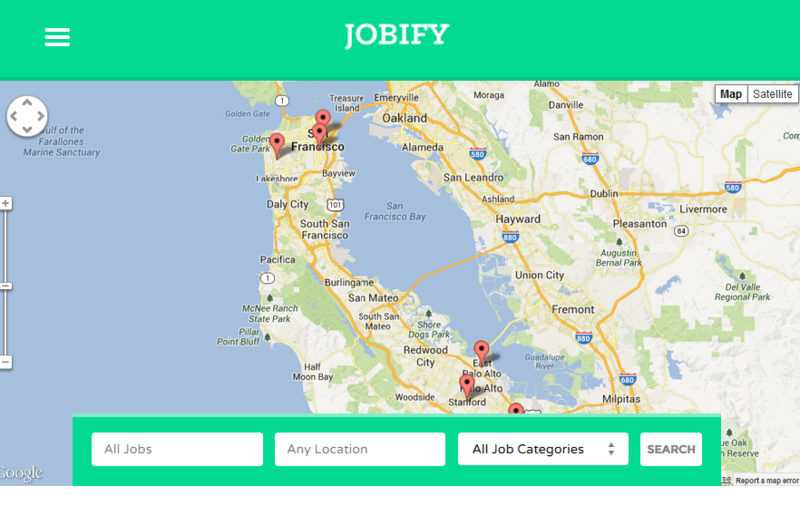 Jobify: a beautiful job board theme by Astoundify. It integrates with the WP Job Manager, Simple Paid Listings, Restrict Content Pro, Testimonials, and Soliloquy Lite. Jobify is Retina ready and has XML dummy content. Job Board Theme: a flexible job board theme for WordPress that comes with 7 color schemes and tons of customization features in the back-end. PayPal is integrated into the theme as well, making it easier to start a paid job board with WordPress. 9 to 5: a quite flexible WordPress job theme. It has 8 color schemes and is AJAXified. It has a separate blog section and can be localized. 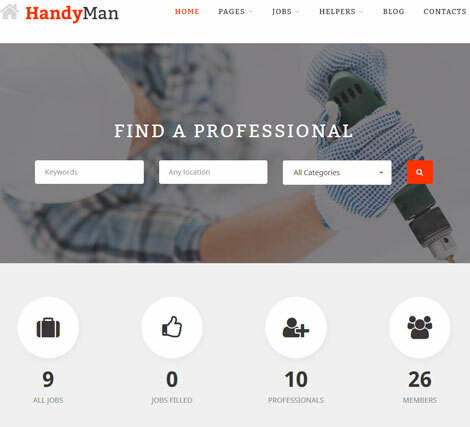 HandyMan: another WP Job Manager board theme that works with WPBakery page builder. It is powered by the Redux theme options panel. The theme is built on bootstrap and comes with Font Awesome icons. Jobplanet: doesn’t require a separate plugin to work. This job board theme has AJAXified job search, WooCommerce integration, and admin reviewable submissions. Users can apply via LinkedIn, CV, or resume created on your site. Jobmonster: this job board theme has 9 home variations. 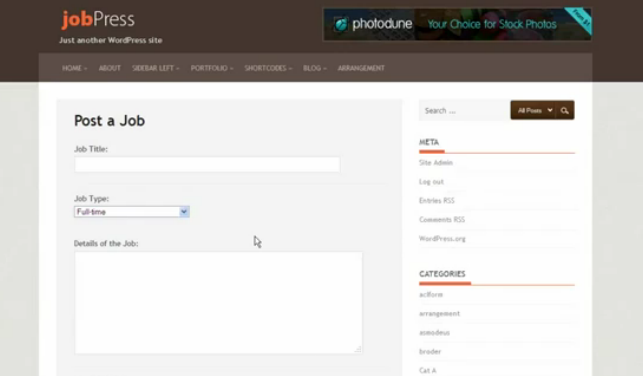 Employers can submit and edit jobs directly on the front-end. It works with WooCommerce. Employers and candidates can communicate on your site via private messages. Jobmonster comes integrated with Slider Revolution. 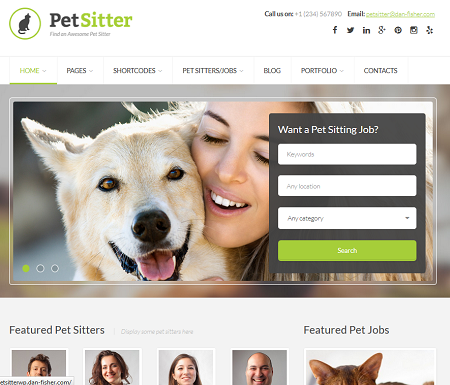 PetSitter: as the name suggests, this theme connects pet sitters with pet parents on your site. It is built on Bootstrap and comes with plenty of color schemes and icons. It is compatible with WP Job Manager and WooCommerce. 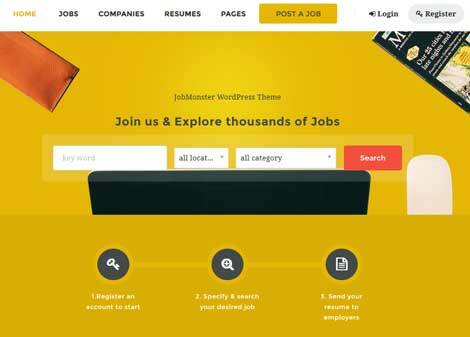 Jobpress: if you are looking for a free job site theme, this template is worth checking out. You get custom post types, taxonomies, and custom page templates. There you have it. Adding a job board to your site is an easy way to take your community to the next level. Thanks to the above job themes, you won’t have to spend too much time doing it. Even though I love job boards since they will get you a job if you keep them under observation, I still think it is a bad idea to create way to many job boards. It gets out of hand and more difficult to keep track were all of the jobs end up. With that said it might be a good idea to create niched job boards instead of the classic one with Wordpress and design. Templatic's Job board is one of the best. It has the advanced functionality yet easy to use. Any suggestions if I'm interested in starting a Job Board where Recruiters can pay to see profiles/resumes? Not quite sure if I have seen a job board that does that. But I\’ll look for it. I would recommend you to check http://wpjobboard.net/ for that! It's not a theme but a plugin, but has plenty of options and I'm happily using it on my site. Great list. I found this premium jobroller childthemes, http://www.jobthemes.com . they look fantastic. 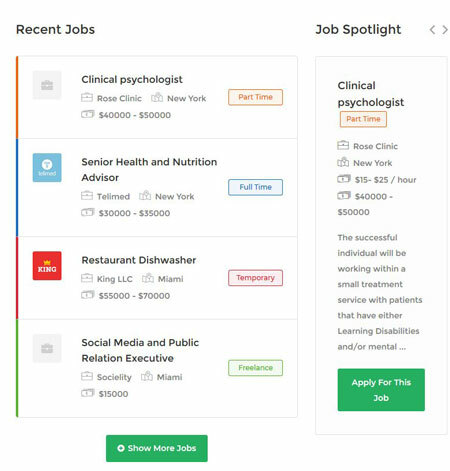 Do you know which of these themes allows you to charge users (job seekers) to access job listings? Jobroller and JobJockey do not, I know. Thanks! I am not sure. Most of the themes I have tested are about charging employers and not job hunters. Don't buy nothing from AppThemes because their support is the worst and their themes have so many problems with them. The don't work as described on their site and false claims that is can do this or that! We have had OK experience with their customer service. What was exactly your issue? Could you be more specific?